Why use ANTS Memory Profiler? Automatic memory management in .NET makes development a lot easier, but it's still easy to introduce memory leaks into your application. For example, forgetting to unregister event handlers can lead to significant chunks of memory being held on to unnecessarily, but spotting that this is happening can be very difficult. Trying to understand memory problems without a suitable tool can take hours or days, if you're lucky enough to know a problem exists. This is time which would be better spent fixing the problem. 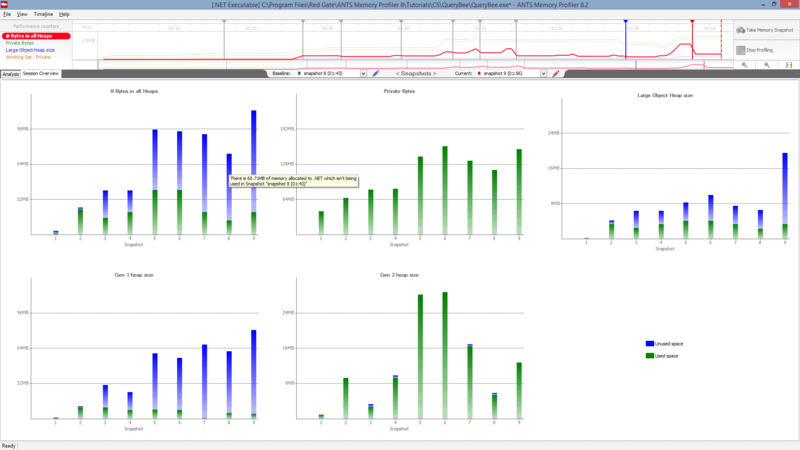 ANTS Memory Profiler makes memory profiling simple. Making it easier for you to interpret the information. Spend your time fixing problems instead of struggling to understand them. With a footprint of less than 32 MB, the profiler can comfortably profile large, complex applications, with virtually no overhead. Take as many snapshots of the heap memory as you like, in seconds rather than minutes. Use the instance retention graph to quickly see why your leaking objects are still being held in memory. You don't have to build a mental map to keep track of how objects reference each other. Intelligent analysis highlights the most likely causes of issues, often saving hours of problem-hunting. Powerful filtering options allow you to cut through the noise, enabling you to quickly get to the root of even the most complex problems. If you're programming in C# or VB.NET, and you need to understand where your memory is going, give ANTS Memory Profiler a try. It takes five minutes to download, install, and start using the tool. 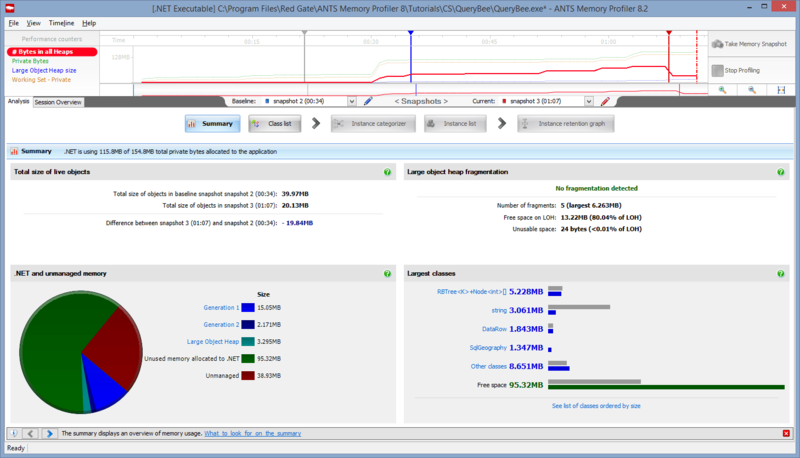 “ANTS Memory Profiler is an incredible, seriously awesome product. A great little tool for finding out what parts of your code take the most time/resources. I have spent countless hours in debugging garbage collection issues, where I had no idea where I was heading. 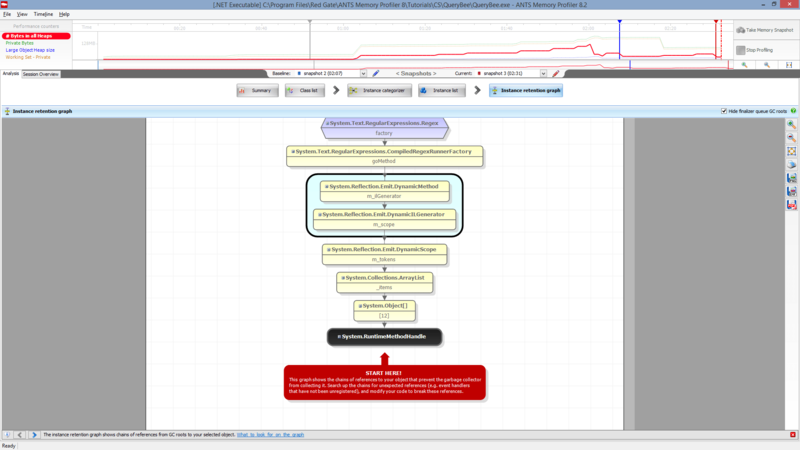 This tool showed me a systematic approach to debug web based application and find memory leak. “I was blown away by the interface and by the quality of information I was able to discover. I've since recommended it to a lot of friends. “I was trying to locate memory leaks in our WPF application and was evaluating tools for helping me with this task. I was having a hard time finding a tool that performed reasonable well until I found the ANTS Memory Profiler. I downloaded the tool and it just works. “I just checked out that new memory profiler and that is freaking sweet! We have a known memory leak that took me about 4 hours to find using our current tool, so I fired up the new version of yours and went at it like I didn't know the leak existed. Aaron Smith, IT Manager R.C. Systems, Inc. 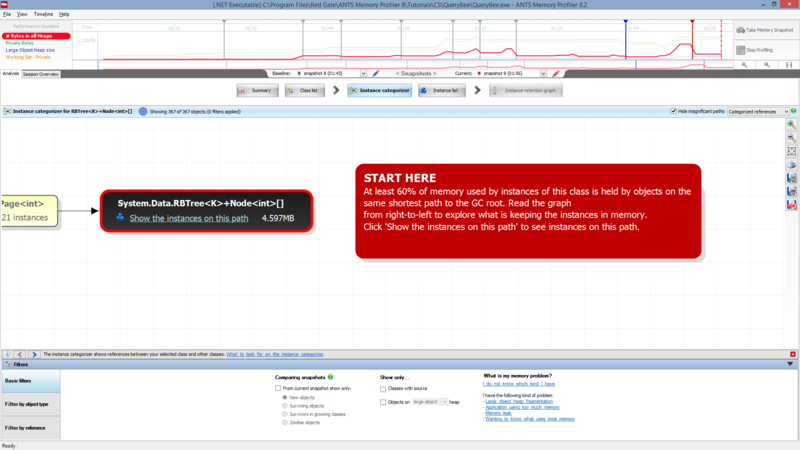 Instance retention graph quickly allows you to see the shortest reference paths to all GC roots, which will need to be broken to fix memory leaks. Compare any two snapshots with each other. Automated API for taking snapshots from within your application using a single line of code. Capable of attaching to a running .NET 4 / 4.5 / 4.6 process. Ideal if you want zero downtime and to preserve the state of your current process. Ability to profile .NET executables, ASP.NET and ASP.NET 5 DNX applications and web services in IIS, IIS Express, and Web Development Server, worker and web roles running in the local Azure emulator, SharePoint 2007 or 2010 collections, Silverlight applications, Windows services, and COM+ applications. Supports .NET 2 to .NET 4.7, including .NET Core and .NET Standard, in any language supported by the .NET framework. Profile unmanaged memory use – if your .NET code uses unmanaged code or components, you can see how much memory unmanaged modules and classes are holding on to. Ability to take and analyse an arbitrarily large number of memory snapshots. Assembly loading view to let you explore memory consumption from static and dynamic assemblies. Native Windows Presentation Framework (WPF) support. Integration with Visual Studio 2010, 2012, 2013, 2015, and 2017 so you can start profiling your application from within your IDE. 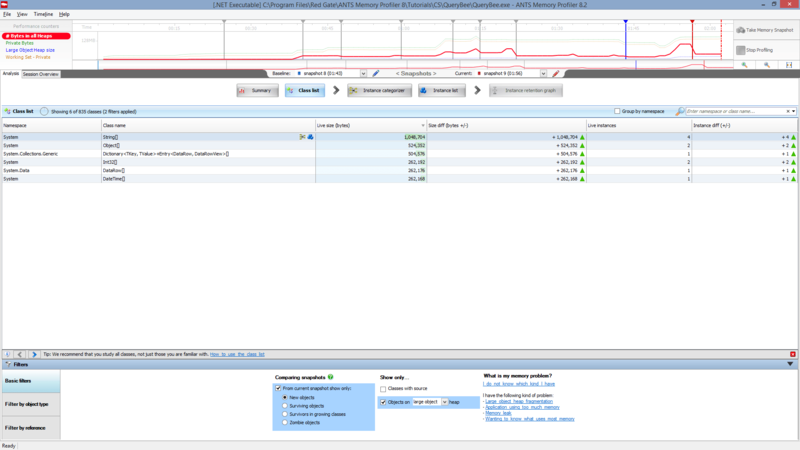 One click launches ANTS Memory Profiler within seconds, with the executable path already set. A quick look at some of ANTS Memory Profiler's features, and how they take the pain out of memory profiling. In this webinar, Clive Tong discusses 5 of the most common misconceptions about .NET memory management. He's joined afterwards by ANTS Memory Profiler lead developer Andrew Hunter for a Q&A session, where they answer questions about how memory management works. Although we don't offer a floating license, Redgate's licensing model includes volume discounts. These are often more cost-effective than a typical floating license model, and they let all your users work with their tools at the same time, without waiting for a license to become free. In the odd case that the volume discount scheme doesn't make life easier for you, we'll happily review your circumstances and work with you to find a better solution. We offer a 50% discount for a single personal license for personal use, hobbyist use, and home use. This license is not available to companies. We've helped lots of organizations in these categories over the years, so we're very happy to discuss circumstances around our licensing. Please get in touch directly to see how we can help. We're happy to provide free non-commercial use licenses for individual students in education, upon verification. Please contact us to apply for a license of this kind and to get more information. If you'd like any help, or have any questions about our tools and purchasing options, please get in touch. Download a 14-day free trial, and start solving your memory problems. Get ANTS Memory Profiler as part of our full performance optimization and debugging package to help you develop fast, high quality web and desktop applications, and save 35% on the cost of the individual tools.